autism spectrum disorder | I am JuJu! As a military family we have the wonderful opportunity to live in all sorts of amazing places. We try to get out and explore the area and support the local economy. Some assignments we do better than others. We have lived in Northern Arizona for a little over 2 years now and we only have 1 year left here before we are off on our next adventure. I was talking with Chris last week and I told him that I really felt like I had slacked off on exploring our state during this assignment. I loved his response: We have an entire year left here, so let’s get out and start exploring. So that is our plan! Sometimes it is easier to just stick close to home as we never know how Skylar is going to respond to an outing, but we are really working hard at preparing her for changes in routine and helping her enjoy different places. 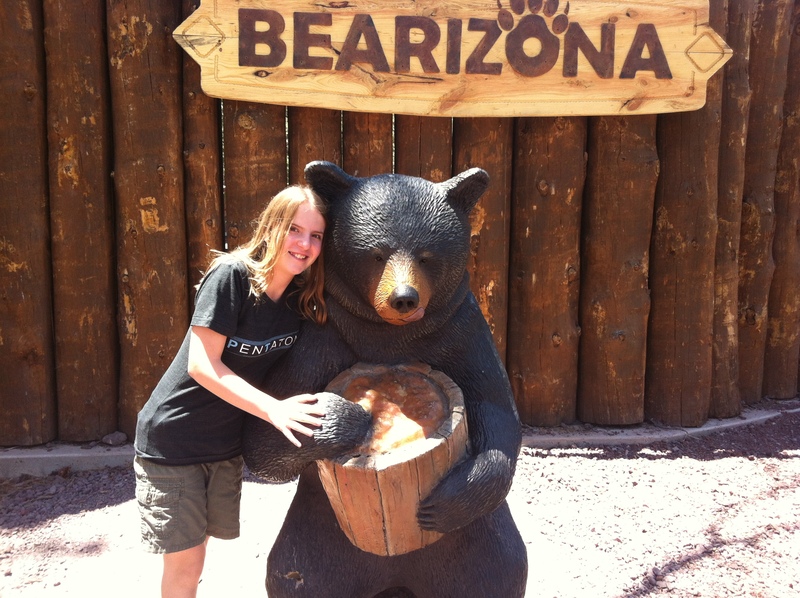 Last week we had made arrangements to go and visit with my friend, Heather and her kids as they were stopping off in Flagstaff on their way to Vegas. 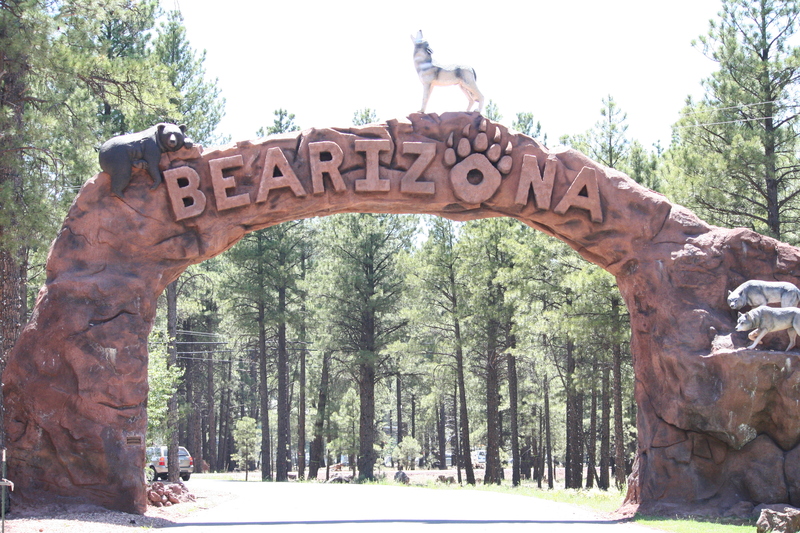 We made plans to meet in the afternoon, but with Chris taking the day off work, I suggested that we stop off at Bearizona, a drive-thru wildlife park on our way. Chris was totally game. We have literally passed this park a dozen or more times on our way to and from New Mexico, each time saying “We should really stop there sometime!” I’m happy to report that we finally stopped talking about stopping and actually stopped. 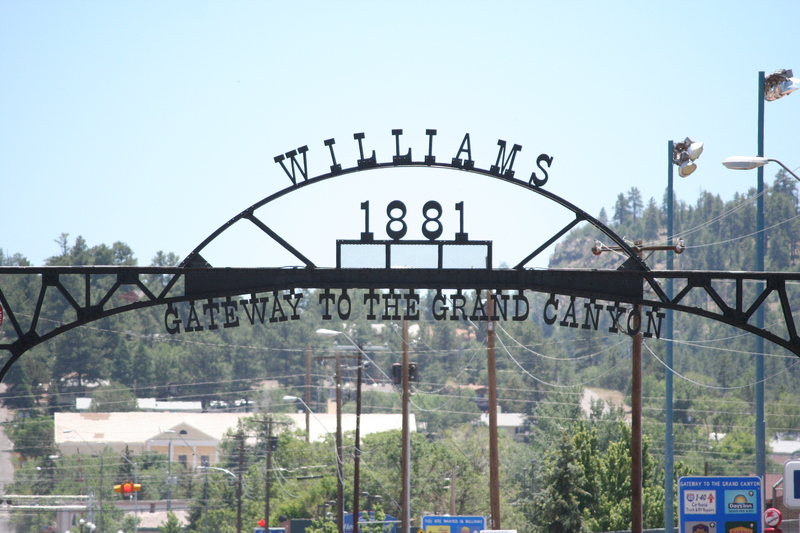 We stopped in Williams to grab a bite to eat. We weren’t sure if there was food available at the park as their website didn’t mention anything. We arrived at the park shortly after lunch and there wasn’t a line at all. It cost our family of 4 about $70 to drive through the park. That included our military discount. The nice thing for larger families is that they don’t charge over $100 a vehicle, so if you have a gaggle of kids, you won’t pay over $100. You can also purchase an annual pass that would cover everyone in the vehicle for $175. My first thought was that the cost was a bit steep for a 2-mile drive thru wildlife park, but at the entrance we found out that the cost not only includes the drive thru part, but also a small zoo at the end, a High Country Raptors bird show, and an open bus tour. After receiving our instructions, we headed into the wildlife park. Hailey was super excited, but Skylar was a bit anxious about the animals coming up to the vehicle after the stearn “windows up and vehicles locked” warning we received. Chris, being the total goof that he is, got totally tickled by the “lock your car doors” warning and kept saying “Seriously! These animals can’t open our doors!” which lead to huge amounts of giggling from me, Chris, and Hailey and lots of “Stop laughing! They are going to get us!” from Skylar! 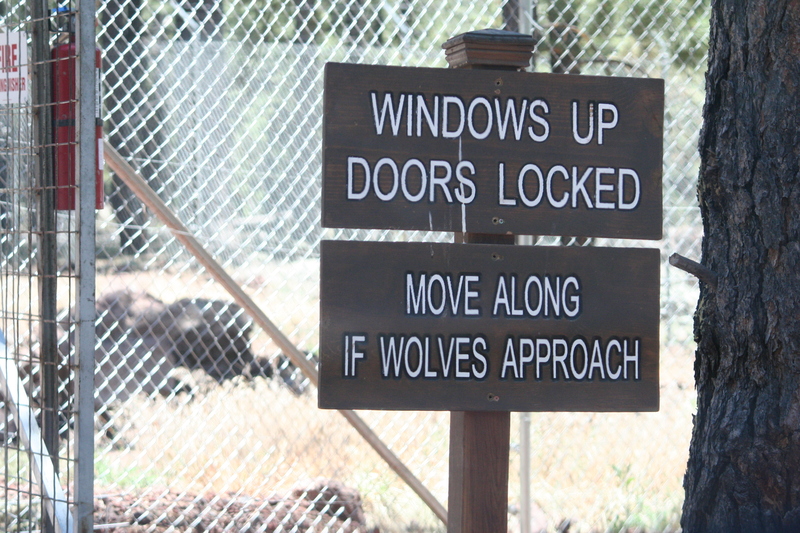 Then we came upon the wolf enclosure. This sign cracked me up! 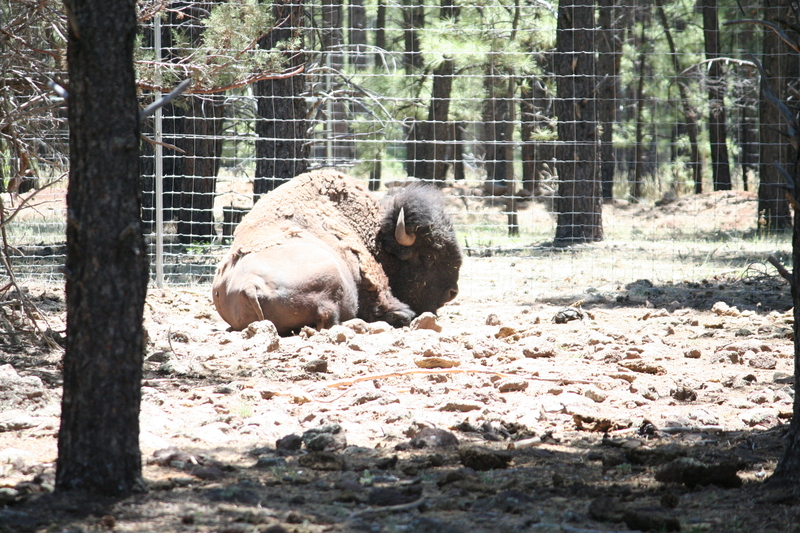 As we drove through seeing a different type of bison, we remarked about the beauty of the mountain! 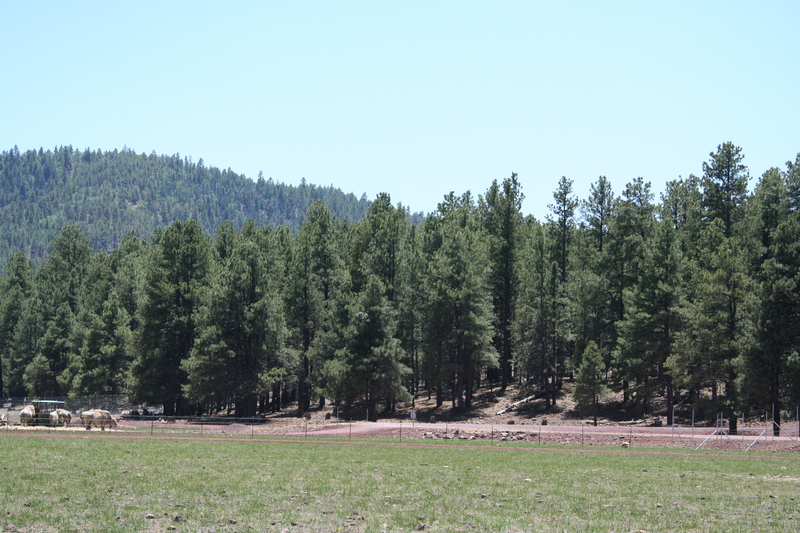 Nothing but beautiful hilltops and pine trees as far as you could see. Northern Arizona is truly stunning! After seeing some more sheep we finally made it to the bear enclosure. The pictures aren’t the greatest as I had to take them through the dirty windows. 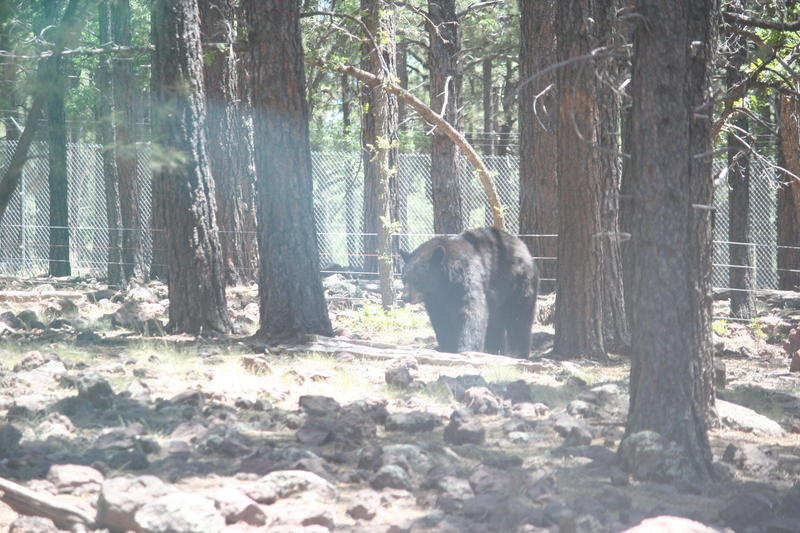 We were thankful that about half way through the bear enclosure that a couple of the bears were a bit more active. 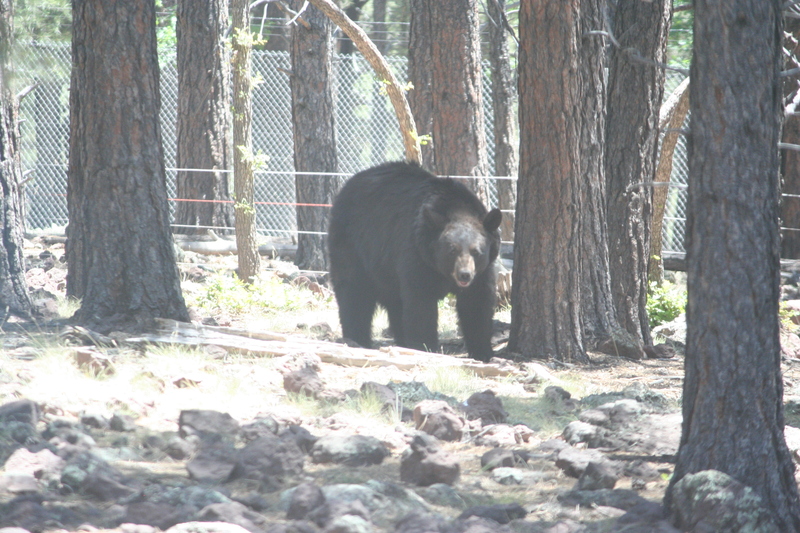 The bear below was a good hundred yards from our car, but Skylar was not happy! She kept encouraging us to keep moving. Our favorite was “Remember the sign? Move along if they approach your car!” She was not even messing around! To her this bear might as well have been sitting on our car. She wanted to get out of there! To Skylar’s delight, we finally came to the end of the drive-thru segment. She wasn’t super excited about getting out of the car to go to the zoo section because she was anxious to get to Flagstaff to see our friends. After explaining to her that they weren’t ready to meet us yet, she got out of the car. As soon as we walked through the entrance she was happy to be there. 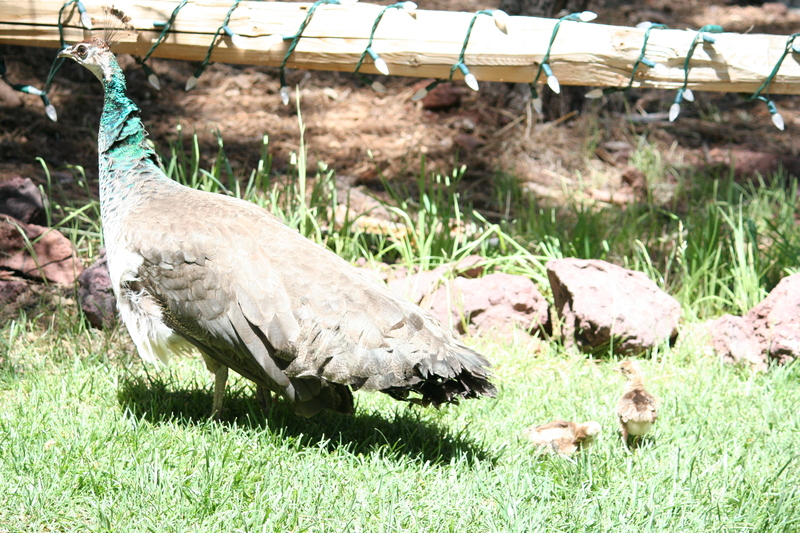 The girls’ loved this peacock that walked back and forth with these little babies following her. We weren’t actually sure if they were her babies or if they belonged to the chickens that also roamed about freely. They also had a really large enclosure for a bunch of bear cubs. They were totally adorable and both the girls loved seeing them. We also got to see a beaver, a porcupine, a badger, a lynx, racoons, a couple of foxes, and some pigs and various other farm animals. We had to stop and take a break as we walked through because Skylar was warm and her feet hurt. 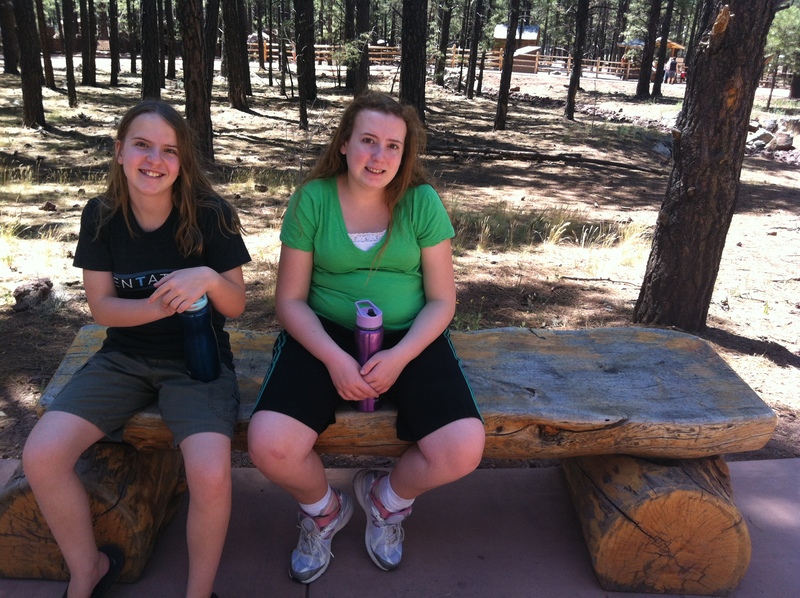 Thankful that they had cute benches all along the way. We just missed the bird show, but we heard some people talking about how neat it was. Maybe next time we will try and time our visit better in order to see it. Also, the zoo did have food and ice cream available so that is nice to know for our next visit. 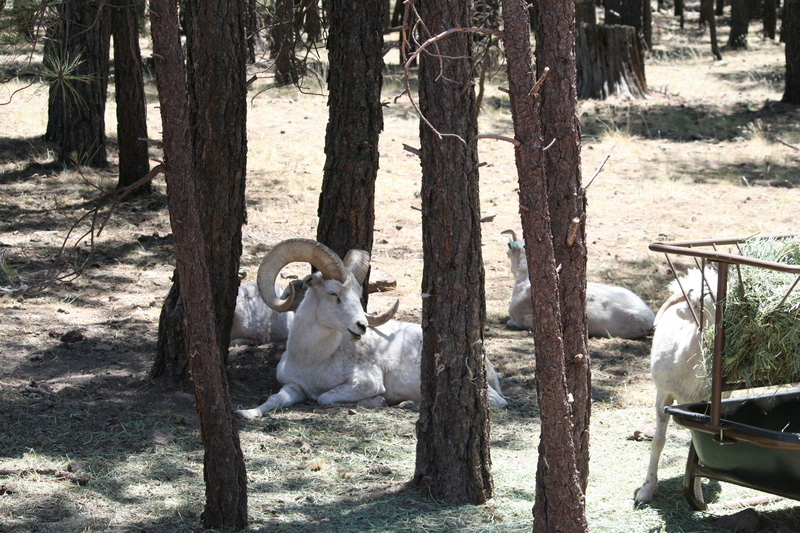 -develop some type of learning activity with the animals in the zoo portion. My thought was some type of scavenger hunt or tic tac toe that incorporated a question that is specific to the type of animal (i.e. I am a nocturnal animal that likes to eat fish & plants and it sometimes looks like I’m wearing a mask. Who am I?) Some of the questions the girls might know right away, but some would require them to read the information about the animals that are available outside the enclosures. Just a thought! We are looking forward to exploring our state even more this coming year. The places that we have down on our list to visit include: Sedona, Jerome, the Grand Canyon, and Tombstone. We would love to hear of any suggestions you might have. We are excited for a fun year of exploring Arizona! Not Only Awareness, but Understanding and Acceptance! April is Autism Awareness Month. 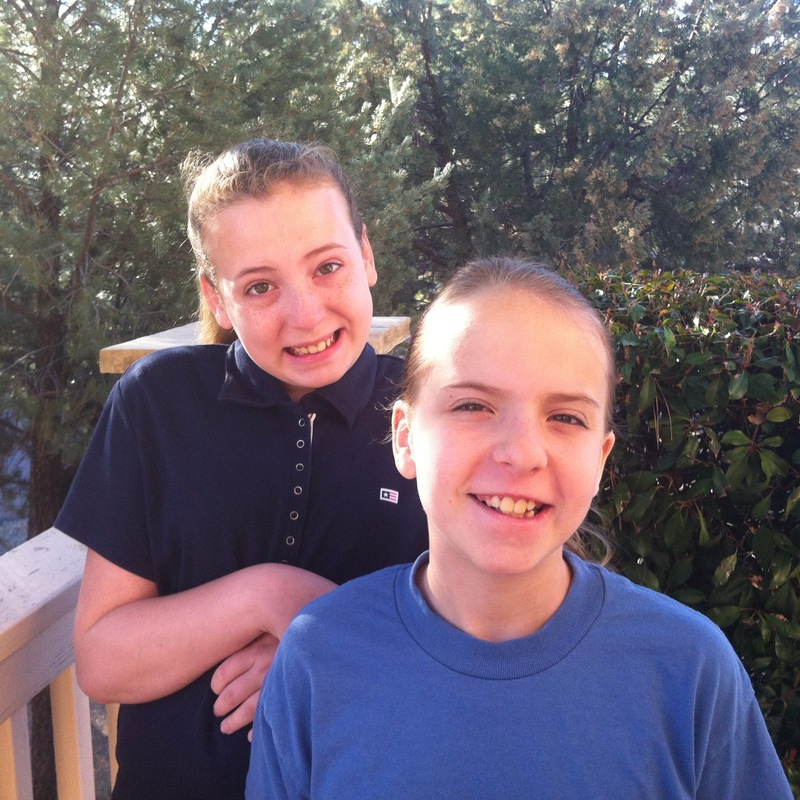 I know our family & friends are completely aware of autism! My personal goal is to educate enough people about autism in order to bring about more understanding and acceptance! Autistic individuals are amazing and unique individuals. Today is World Autism Day and we are wearing blue as we stand together with thousands of other families around the world that have a child or children with autism. We will also be “lighting it up blue” tonight. Our porch lights have all been changed to blue lights. I will be sharing a lot with all of you this month, but today I want to share 5 important things! 1) Be aware! The CDC just released their latest report last week that stated that 1 in 88 individuals in the United States have an Autism Spectrum Disorder (ASD). Those numbers are alarming, not only because it is up from 1 in 110, but also because these numbers are actually from data collected in 2008. When Skylar was diagnosed in 2002, she was 1 in 160 kids diagnosed with autism. Whether or not you believe that vaccines play a role, that there is an environmental factor, or that genetics factor into play, we should all be concerned by the rising prevalence of autism. If you don’t know someone with autism now, I assure you, you will soon! 2) Be Kind! There is a divide in the autism community! Those that support Autism Speaks & those that hate them! Those that believe vaccines cause autism & those that do not! Whatever side you are on, the first thing that you should remember is that we all love our kids so very deeply that we would do anything & everything in our power to help them! I have been deeply saddened at the name calling & the extreme judgement that I have seen within our community. Common courtesy goes a LONG way ladies & gentlemen! 3) Get involved! Whether it be with an actual organization, participating in a walk, or helping a family you might know that has a child with autism. I have been so deeply touched by our friends and family that have come along side of us to help with our fundraising efforts for Skylar’s bicycle! You can read about our efforts here. 4) Don’t judge! This is a biggie! If you are in the grocery store and you see a child having a meltdown, don’t assume they are misbehaving. The stares and the comments like “if that were my kid I would just spank her” or “wow, what a terror” do NOT help. The judgement HAS TO STOP! 5) Ask questions! If you have concerns about your child don’t be afraid to ask for help. Ask for further testing and share your concerns. Making a list of your concerns such as your child’s lack of language and social skills is a good place to start. Early intervention is key! As always I am happy to answer any questions you might have! Make sure you check back here regularly as I will be doing several giveaways this month including a beautiful autism awareness bracelet from my mom and a set of flashcards from Goosie Cards.